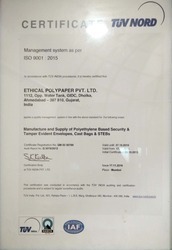 Established in the year 1996, we, Ethical Polypaper Pvt. Ltd., are a trusted firm engaged in manufacturing and exporting a comprehensive range of Mailing Envelopes, Security Envelopes, Bubble Envelopes and much more. Manufactured using optimum quality raw material, procured from reliable vendors of the industry, these products are designed under the able guidance and expertise of our professionals. Furthermore, these products are widely appreciated for their supreme quality, excellent finish, lightweight, unique designs, tear and water resistance. We make these products available to our esteemed clients at leading prices in the market. We have a well-organized infrastructure, spread across a vast area of land. The entire unit has been properly segregated into various departments in order to carry out the production process in a smooth and streamlined manner. Manufacturing unit, quality control unit, R & D unit, sales, and marketing unit, warehousing and packaging unit, being an integral part of the organization are well furnished with the latest machines, tools, and equipment in order to deliver a flawless range of products to our clients. These departments are handled and controlled by a team of highly qualified and experienced professionals, who hold in-depth knowledge about their respective domains and are well versed with the market trends and demands of the customers. These professionals are instrumental in offering the entire range in standard specifications and are also capable of customizing these products as per the specified details provided by the clients. Furthermore, being a part of a quality driven organization, our professionals make sure to test the quality of the entire range on certain well-defined parameters, in order to serve our clients in the most proficient manner and grow remarkably in this highly competitive industry. Under the expertise of our Managing Director and Mentor, Mr. Dhiren Desai, we have been able to serve our clients with an absolutely defect-free range of products. Owing to his brilliant managerial skills, able guidance, and vast industrial experience, we have been able to carve a niche in this industry. He has truly been a source of inspiration to all those who are associated with our organization. The company has been established by highly qualified technocrats and professionals having a sound technical background and proven track record in business. The promoters have been operating in the field of energy & petrochemicals. Thus, the company has a professional approach to management and its management is committed to supplying high-quality products and efficient service backup. Our Company has an integrated Manufacturing Facility with a captive power plant. Hence we have full control on our product quality and production schedule. Backed by a team of adroit professionals, we are able to serve our clients with a quality-assured range of Packing List Envelopes, Tamper Proof Bags, Mailing Envelopes, Security Envelopes, Bubble Envelopes and much more. Our experts are highly experienced in their respective domains and are well versed with the trends and demands of the market, therefore are instrumental in catering to their variegated needs in a timely manner. Furthermore, they are also capable of customizing the entire range in accordance with their specified requirements, thereby being able to serve them in the most efficient manner.